Have you ever experienced discrimination as a result of your race or nationality, in your local community, workplace or at school? The Ministry of Justice’s Human Rights Bodies have a counseling service for people who believe they have been victims of human rights violations. These bodies will assess the situation and, as need requires, carry out investigations and take appropriate steps to help victims and prevent future occurrences. If you are worried about a possible human rights issue, get in touch. A staff member will be on hand to discuss your problem, and together you can look for the best possible solution. The number of foreign nationals entering Japan is on the rise, which may lead to a similar increase in human rights-related problems stemming from differences in language, religion, culture and customs. 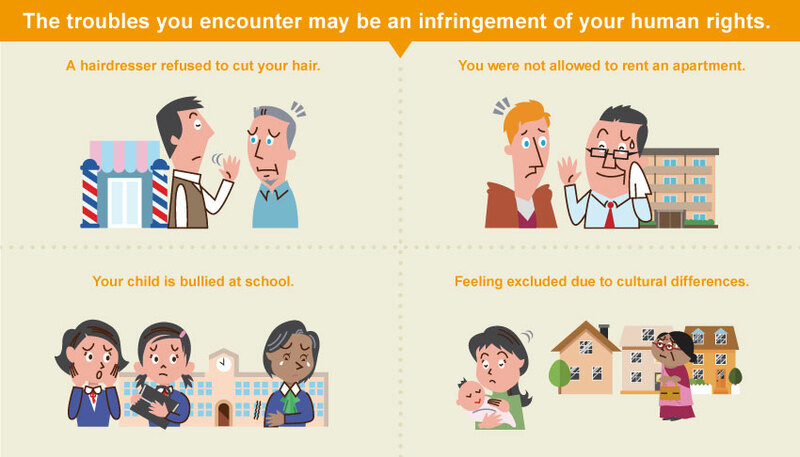 Examples include being refused a rental property or store service on grounds of nationality, or one’s children experiencing bullying at school. With the aim of giving proper respect to the human rights of foreign residents, the Human Rights Bodies has set up human rights counseling services accessible by phone (Foreign Language Human Rights Hotline), online (Human rights counseling services on the Internet) and in person (Human rights counseling centers), through 50 Legal Affairs Bureaus and District Legal Affairs Bureaus nationwide, to support foreign residents who are not fluent Japanese speakers. • As the bureau is a governmental body, all advice is neutral and impartial. • Advice is offered free of charge, and no paperwork is required. • Referrals, legal advice, mediations¹ between the relevant parties and interventions² demanding an improvement in behavior from human rights offenders are offered, as considered appropriate. ※¹ & ² these measures will only be taken with the understanding and agreement of the relevant parties, and cannot be forced if either party is unwilling. As the bureau is a governmental body, all advice is neutral and impartial. I just spit up my coffee on this one! So... refusing someone a rental based on nationality is illegal? Good on the government for doing this. There is definitely a problem in Japan at times - renting in Japan is a pain in the a$$ as a foreigner. It's good the government is recognizing this and working on it. Is this a joke? First of all a hairdressed refusing to cut your hair is not a human rights violation. You don't have a RIGHT to be served. It's a private business, and the employer has the right to refuse to serve anyone they want. If you look at it from their perspective, they have a human right to operate their business the way they want, and serve the people they want. And second of all, what are they going to do about it? They are going to find the kids that bullied me and do what? Scold them? Are you kidding me? Whoever comes up with these ideas is mentally a child. I wonder though strangerland is there actually a law that says you can't refuse service based on nationality? I think this service is a good idea too, but sure proactively sending to all registered rental companies that you can't discriminate based on nationality should be happening too. I wish this had been around in my early years here, I own my own place and generally have very few issues these days but remember being shocked and heartbroken when I got turned away from several rentals I tried to get. ILivecoffee, not exactly if you serve the general public you have to serve the general public. This what are your rights thing has gotten very strange because of some odd things in the US but.. you have a business serve the public you have to serve the public and there are certain protections for some categories, race, religion and nationality.. your right as a business owner is to have a business or not, not to restrict who walks through the door provided they are otherwise behaving. To say, you have the right, the reasonable expectation to have access to publicly provided services. Bullying. They will hopefully contact the school make sure they are doing the right thing by their students to give them reasonable access to education (including not having a unduly difficult time at school).. as it is a human right. But .... can I really trust them? Don’t expect any action from them though. “The nail that stands up must be hammered down.” This agency is not going to take any action against Japanese employers. Do you know what property rights are? Does this website have a duty or obligation to allow anyone to comment? No, they can delete my comment and ban me if they want, its their right. Just because i operate a business does not mean i have to serve everyone, i am open to whoever i want to be open. You can't walk into a Jewish cake shop and DEMAND them bake you a nazi shaped cake. They have the right to kick you out if they want. Its called private property. The business makes the rules who they will allow on their private property, and who they will not allow. You don't have a right to enter my house unless i invite you to it. The Ministry of Justice’s Human Rights Bodies have a counseling service for people who believe they have been victims of human rights violations. Wonder if they will also handle foreigners complaints regarding mistreatment by J cops! Good on the government for doing this. There is definitely a problem in Japan at times - renting in Japan is a pain in the a$ as a foreigner. It's good the government is recognizing this and working on it. But who's fault is that? I'm a foreigner and also a landlord here in Japan. I've never actually had any foreigners apply to be tenants, but if they did, I'd also be very reluctant to accept them. It doesn't strike me as a violation of human rights to recognise that the employment and immigration status of foreigners is often far more precarious than that of Japanese tenants. If a Japanese tenant skips town without paying their rent I can still reasonably pursue them, while a foreigner who leaves the country is effectively untouchable. Why should the law force me to take on additional or perceived financial risk? Honestly, one of the refreshing things about Japan is that there's still a healthy respect for the fundamental freedom of association. This is a freedom which has been eroded in the west by anti-discrimination laws to the point that it effectively no longer exists. How can anyone justify having the law force someone to unwillingly dispose of their property or to cut someone's hair against their will? The idea that we can somehow legislate a society free from all forms of unjustified discrimination while still allowing justified discrimination is a utopian fantasy. Most people who discriminate are rational actors, not xenophobic bigots. This looks to be a ridiculous joke being played on foreigners in Japan. Counseling is not the solution when someone needs a place to live,is it? Discrimination is largely not punishable in Japan where excluding foreigners by signage and refusal of service is rampant in certain businesses. you know what property rights are? Does this website have a duty or obligation to allow anyone to comment? No, they can delete my comment and ban me if they want, its their right. Just because i operate a business does not mean i have to serve everyone, i am open to whoever i want to be open..
Oh, Ilovecoffee, it must be an interesting world to not understand laws and regulations. IF we had your world vision, businesses could discriminate at will, meaning gays could theoretically never fill a prescription, or foreigners could never ever walk into a restaurant, a business and be served, as someone's bigotry trumps (pun intended) someone's else's rights. And if this is OK in Japan, then businesses in China and the USA have the right to discriminate against Japanese and other foreigners. Such a world is a hellscape. IloveCoffee, so if the next time you go to your local coffee shop or COOP or pub and they listen mate, we don't want whites, blacks, Chinese--insert your ethnicity--in here, we'd like you to leave, you'd be OK with that? Or say you have a kid, and they were treated in similar fashion, you'd still feel sanguine and shouganai about it? I remember when I first came here, I lived in a relatively small Hokkaido town and there were lots of issues involving the local onsen--mainly originating with some drunken Russians. Anyway, I didn't want to use the onsen but in walking about town, I got the big batsu arm gesture frequently--barbers, pubs etc. My Aussie mates and I would respond with we're not Russians we're ... and often that worked, but I knew a lot of the local Russians, some married to Japanese with small kids, nice as could be. This was 20 years ago, and I know things have dramatically improved, but I doubt if anyone who's been on the receiving end of such discrimination would dismiss it in such a cavalier way. surprising to see such negative comments on something the gov't is trying to do...you complain when they don't help and complain when they try to help. is it any wonder why even foreigners hate foreigners? I think it's a grey area. I'm going off memory here, and I have a notoriously poor memory, but if I recall correctly Japan is a signatory to some Human Rights agreement, but in many areas there are no Japanese laws guaranteeing rights to foreigners. In other areas there are (such as employment). You can't walk into a Jewish cake shop and DEMAND them bake you a nazi shaped cake. How is that an equivalency to say, me trying to rent an apartment for my family to live in as participating members of society? I'm a foreigner and also a landlord here in Japan. I've never actually had any foreigners apply to be tenants, but if they did, I'd also be very reluctant to accept them. That's sad. If I were to try to rent your place, you would be reluctant to rent to me, based on the nothing I've ever done, no knowledge of my history, nor any understanding of me beyond the fact that I was born on the wrong piece of dirt. I prefer to judge people on the merits of their actual person myself. But I know there are others who feel differently. I second Strangerland's position on this one. I am a Permanent Resident here and have a business as well. Your statement is very sad and I would say borderline pathetic. I would imagine you are missing out on some potentially great tenants. You may want to open your mind and also considering the changing demographics you may actually need to (heaven forbid) rent to another lowly foreigner. I was asking a question as to if it’s legal or not, not making a statement. As to your shop analogy, and knew that’s where it was going.. let’s stick with that. I’m not saying asking for something they don’t make, (without going to your nonsensical straw man) just the ability to buy what anyone else walking in off the street could. Perhaps you are one of those no “gay” cake people.. look a cake artist could probably say, I don’t make specifically “gay supportive” cakes but I’m not going to refuse to sell you anything else I would ordinarily make for the general public. Seems fair right. In my private business I have done projects that don’t fall within my personal beliefs and let the customer know, to check they were ok working with me and then requested they didn’t have my name associated with it, but didn’t refuse. (I provide a service rather than a product.. but I had to think long and hard about what was the right thing to do). Its a shame that a non Japanese landlord would outright reject someone without knowing their situation. This is what frustrated me so much, I get not wanting unnecessary risk, and feel it should be ok for a reasonable enquires as to intent and abitlty to pay, but even when prepared to show income (well above the norm for my age at that time) and my visa status and even contacts from “home” (haven’t lived there over ten years so feels weird to say that) I was still flately refused based on the fact I’m not a citizen. Anyway back to the story at hand, I’m sceptical to as to how useful this might be, without penalties there would be a lot of tooth sucking and “it’s a little difficult” but at least it’s some recognition of the problem. It's not sad. I don't know anything about the life histories of my Japanese tenants either (apart from the fact that they are employed, have an income, have a suitable guarantor, and seem like normal people to the rental agent). I've never even met any of my tenants face to face. It's not normal, practical or cost effective to sit down and interview prospective tenants about their life story. My main concern with renting to a foreigner would be that if they stop paying the rent and then abscond months later, I will have no possible recourse against them because they are most likely to be back in their country of origin. The fact that the foreign tenant knows this may impact their behavior. Because there are other tenants to choose from, this a risk not worth taking for me and other landlords. It's good the government is recognizing this and working on it. Look at it from a different angle if you can. Government intervention is the main reason why landlords in Japan are so cautious and discriminating. If I were legally allowed to physically evict a tenant and dump their possessions in the street the minute they were late with a rental payment or failed to abide by other terms in the lease (garbage disposal, noise, etc), then I would be far less concerned about who I rented to. In reality, there are extremely strong tenant protection laws in Japan which effectively prevent landlords from evicting anyone for months, or even years. This drastically increases the financial risk of renting to a bad tenant and makes landlords far more cautious than they otherwise would be. The rental or almost lease situation in Japan does make things difficult I agree. However I wish that rather just saying no because it’s too hard the rules allowed for contracts that for breach of contract and potentially evictions when people have more than the intended occupancy, don’t follow other reasonable rules of the property, don’t pay rent for extended times. A great tenant for me is just someone who a.) pays their rent on time, and b.) continues to live in the apartment long term, c.) doesn't cause problems for other tenants. There is nothing else I'm expecting to get from my tenants. If demographics change to the point where taking on the risks of foreign tenants become unavoidable and in my self interest, then so be it. The point is simply that 99.999% of landlords are acting in their rational economic self interest when they reject foreigners, not out of some racist conspiracy to keep their building ethnically pure or some other xenophobic motive. It's completely unreasonable for anyone to expect landlords to sacrifice their financial interests for social justice or hurt feelings. It is possible to get around your problem of renting to ‘anyone’ by charging a deposit and in the case of a foreigner checking their employment contract/visa details. Any legal action or complaint can easily be forwarded to the MOJ resulting in loss of the right to remain. I would prefer to rent to a foreigner, they are less likely to complain and in most cases, vacate the premises smoothly at the end of the lease. I’m curious M3M3M3 if you are using an agency did they ask you when you had them represent your property was are foreigners ok one of the questions? I can tell you for a fact this is untrue. I have been rejected places simply because I am a foreigner. My salary is quite high and I am a Permanent Resident of Japan. The rejection had nothing to do with my income or economics. Based on your expectations there are numerous foreigners in Japan that meet your requirements. I am sure we are not at your level however there are numerous of us. It's not sad. I don't know anything about the life histories of my Japanese tenants either (apart from the fact that they are employed, have an income, have a suitable guarantor, and seem like normal people to the rental agent). Wait wait wait, you went from talking about discriminating against someone based on their non-Japanese ethnicity, and are now comparing that with the background check on a Japanese person. These are not equivalent. My background check is going to be significantly better than the large majority of Japanese people. I've got 20+ years of stellar credit rating, including paying of some extremely large loans in complete, without a late payment. But you still would discriminate against me based on my being foreign, associating that with some belief in your mind about how foreigners act. I haven't rented for 15 years and reading about the travails of the landlord class makes me quite happy about that. My main concern with renting to a foreigner would be that if they stop paying the rent and then abscond months later, I will have no possible recourse against them because they are most likely to be back in their country of origin. And that's just stupid. My life is in Japan. My family is Japanese, my businesses are here. My credit history is here. I'm not going to run from here anymore than I would run from my home country were I living there. Not to mention I'm an adult, and adults pay their bills. But because you've decided that foreigners are prone to this, you are willing to discriminate against me based purely on being born on the wrong piece of dirt. Yeah, I think that's sad. To some degree, I have to agree. I've always been on the fence about whether it's better to have someone say no to your face directly, saving you both time and hassle, vs. doing it subversively through loopholes etc. The point is simply that 99.999% of landlords are acting in their rational economic self interest when they reject foreigners, not out of some racist conspiracy to keep their building ethnically pure or some other xenophobic motive. Unless you have numbers to show the assumptions you make to be true, denial of rental to foreigners based purely on ethnicity is exactly xenophobia. Not some approximation of it, it's exactly what it is. Charging a massive deposit would certainly be one way to alleviate the risk, but I wonder how many landlords will accept the hassle and cost of drafting a bespoke contract, especially if there are other prospective tenants available. I suspect landlords in smaller cities with declining populations are far more flexible and less discriminatory. No. But maybe it’s only because I’m a foreigner? I'm open to the idea that foreigners may do midnight runs at an elevated rate, but I've never seen anyone making that argument provide anything to support it. I contend that it's purely their own xenophobia as the basis of this stance, not any empirical data. You seem to be missing the point that @M3M3M3 is trying to make. For most rental agencies, the landlord isn't going to know that you're a Permanent Resident (as if that would even make a difference).. Renting is a business venture for them, as much as owning a company is, and for the most part is their sole source of income. It's completely reasonable for them to want to mitigate risk of missed payments or, heaven-forbid, skipping back home. Japan doesn't provide legal recourse to pursue non-Japanese citizens if they decide to go back home. Being a permanent resident doesn't mean that the same protections for the landlord would apply to you. You're still a citizen of another country. You're right to say the rejection had nothing to do with your income or economics. That's 100% true. But it isn't a racist or xenophobic act for the most part, its mitigation of risk. This happens everywhere in world in relation to renters, it isn't just a problem in Japan. For the most apart I generally agree with you Stranger, but this just isn't correct. It isn't denial of rental to foreigners based on their ethnicity. It's denial based on their legal status in this country. How would a landlord know the ethnicity of someone interested in renting in their building? Unless it was a personal contract and they went to meet them personally. I've never actually had any foreigners apply to be tenants, but if they did, I'd also be very reluctant to accept them. Don't you ask your tenants to provide a guarantor (like nearly every other Japanese landlord)? If you do, why are you worried about the tenant leaving the country without paying? The more I see stuff like this and reflect on how I was treated and the time spent there,.. its like I was a traumatized prisoner of war. I guess that is also why many other POWs would also state they were not treated humanly by those bastards. It's not the laws, stupid !!! It's the people !!!! Is there a human rights system in Japan ???. If the Japanese people do not start to be more open in the heart and stop bullying foreigners or their own Japanese, a body does not help. Pls refrain from just surface actions. Pls do the whole works. "My name is Carlos Ghosn, and I've been held captive for the past three months in Tokyo..."
In the case of permanent residents, they check all of the boxes you in your list. In the case of non-permanent residents - what is wrong with the guarantor that they are required to supply? Further, as Strangerland has mentioned, there is no empirical evidence to support the notion that foreigners are more of a flight risk than their Japanese counterparts. It's just a negative stereotype of foreigners. And? It still happens. Good luck trying to prove you've been rejected because you're a foreigner on a visa that is fairly temporary. People don't seem to get it through their heads. You aren't entitled to live in that person's property. In Japan landlords have full discretion on who they want to rent to. It doesn't particularly matter what it's like in the US or anywhere else. Within the constraints of the Japanese legal system, including tenant landlord laws, and pursuance of unpaid debt laws, everything these landlords do is completely legal. Complaining about it won't change anything. @ksteer - so, we understand that rejecting someone based on the fact they are a foreigner is acceptable to you. @NZ2011Today So... refusing someone a rental based on nationality is illegal? Well what ive seen with friends that run share houses and apartments why would you want to rent to foreigners..
For the most apart I generally agree with you Stranger, but this just isn't correct. It isn't denial of rental to foreigners based on their ethnicity. It's denial based on their legal status in this country. I'm a permanent resident of Japan. When renting places in Japan, the real estate agent phones the landlord and asks if they will rent to foreigners. There is no discussion on my legal status, purely my ethnicity. I am denied based on that question. Therefore the denial is based on my ethnicity, due to their perceived belief that foreigners are a flight risk. After all, Japanese people can refuse to pay and move overseas as well, and there will be just as little recourse as if I did. And the belief that foreigners are more likely to do so is based purely in xenophobic beliefs, not in empirical evidence. How would a landlord know the ethnicity of someone interested in renting in their building? Unless it was a personal contract and they went to meet them personally. Have you never rented a place in Japan? The process generally goes that you visit a real estate agent, they show you a number of floorplans for properties, you pick the ones they like, then they phone the landlords and ask if they will rent to foreigners or not. In my experience, somewhere around 1/3 of landlords say no. People don't seem to get it through their heads. You aren't entitled to live in that person's property. In Japan landlords have full discretion on who they want to rent to. And that's exactly the problem we're discussing. Complaining about it won't change anything. And it ignores the fact that it appears the government is indeed trying to do something about it - look at the story we are commenting on. Thats like low income agents, my agent with mitsubishi estate never had to ask any such questions... all depends on quality of your rental property and your income / social status. I would never rent my place out to anyone making under 6grand a month either. Sorry to hear that, but was it purely based on your foreignness or because being foreign correlates with a unique set of risks for the landlord? The landlord will never get more out of you than the monthly rental fee, so your high salary is not necessarily more appealing than an average salary. Wait wait wait, you went from talking about discriminating against someone based on their non-Japanese ethnicity, and are now comparing that with the background check on a Japanese person. These are not equivalent. Sorry, I'm not exactly sure I understand what you mean here. I don't conduct extensive background checks, it's not something that's very common in Japan. The approval of a prospective tenant is very arbitrary. Once someone shows that they have a job, income and guarantor, it usually just boils down to whether the rental agent gets good vibes or not. It's a gamble on the landlord's part. My background check is going to be significantly better than the large majority of Japanese people. I've got 20+ years of stellar credit rating, including paying of some extremely large loans in complete, without a late payment. A Japanese landlord will never be able to check your credit history. For better or worse, there are no Equifax-style commercial credit rating agencies where someone can verify whether or not you pay your bills on time. The data that major banks keep and share with eachother is for their own internal use and strictly regulated. At most, rental companies and agencies might check their own blacklists of problem tenants. I appreciate this, but I used to know many foreigners who said something similar prior to March 2011. The reality is that having a Japanese spouse and a card in your pocket which says you are allowed to stay permanently is no guarantee of anything. I'm also a PR with a family in Japan, but life happens to everyone. If one of my overseas family members were to suddenly become ill or die in an unexpected accident orphaning their children, I might have to leave Japan on short notice. Hopefully I would have enough money to settle any outstanding obligations, but many foreigners would not. denial of rental to foreigners based purely on ethnicity is exactly xenophobia. Not some approximation of it, it's exactly what it is. I'll grant you this. It might meet the strict definition of xenophobia, but it's not completely irrational or unjustified xenophobia. The same concerns would apply to any Japanese citizen who tries to rent an apartment in Tokyo but has their locus of activity in Hawaii, most of their family in Hawaii, friends in Hawaii, employment prospects in Hawaii, etc. Well, just imagine the outrage on these threads if the Japanese Government actually collected and published this sort of data. You can't really complain that it doesn't exist. But ultimately whether the risk is real or entirely imagined, my basic point still stands. That is, landlords are not discriminating against foreigners purely based on a racially motivated dislike of foreigners. They are doing it to protect their financial interests. If Japanese people were suddenly perceived as posing a greater financial risk, Japanese landlords would start discriminating against Japanese people. Sure, but a guarantor is not a panacea. Pursuing a personal guarantor is extremely difficult and not worth it if you have to go to court, and even in the best case scenario the guarantor will only be on the hook for the outstanding rental fee. The guarantor won't be liable for all of the additional costs the landlord incurs to retake possession of the property (or lost rental income). In Japan, even if it becomes obvious that a tenant has skipped town and isn't coming back, a landlord can't just re-enter and take possession of their property. You need to schedule a court hearing and go before a judge to explain the situation and request permission to cancel the lease and re-enter to dispose of any belongings. The process takes months and the legal fees are astronomical. Fair enough, if you are basing that judgement on their income. I make significantly more than this a month though, and I still get denied for places due to my ethnicity, with no check whatsoever of my circumstance. And, as always, unfairly nitpick everything Japan does. If the ministry bureau never did this, the anti-Japan crowd would complain about how 'racist' and 'xenophobic' all Japanese are towards foreigners. Yet, the ministry bureau is doing this, and the same people now complain that it's not enough, it's suspicious and will need time to see if it's effective, etc. Always a lose-lose double standard situation with Japan. At least Japan is doing something for its foreigners, unlike many other nations. Good for them. I am happy Japan is a homogeneous society with foreigners having to adjust to local laws and customs and not the other way around. and yes Tokyo -Engr I also am happy that a landlord is fully able to reject someone just cause they dont like the looks or smell. In other words, some foreign residents of Japan fully support discrimination against, wait on it, their fellow foreigners. Of course, this kind of attitude is not restricted to "homogeneous" nations like Japan. It's also fairly common in immigrant nations. The first group of newcomers arrives, adapts or assimilates to varying extents. Then a certain portion of them promptly turns around and cr--s all over the next wave of arrivals. I guess they enjoyed their own trying experiences so much--xenophobia, discrimination, overcoming language barriers and just the daily struggle of adapting to an entirely different culture--that it's only right that they add to the next group's burden. You know, in lieu of seeking common cause and striving to make society better for all residents, old and new alike, native and emigrant alike, it's far better to mock the guy worse off than me. You're basing your hesitation to rent purely on their being foreign, not on their credit record, and not on your feeling of them. Simply because of their ethnicity. And this is because you seem to have the impression that foreigners are more of a risk than Japanese people, yet you have shown nothing to show that this impression is based on actual risk, only on your perceived risk based on their ethnicity. I know you don't like to hear this, but that's straight-up xenophobia/bigotry, and even racial discrimination. Your discrimination is not based on any real data, only on your perceived racial biases. I don't know specifics on credit checks in Japan, I doubt they use the American company you mentioned. But I do have to submit my financial details when renting a place. And there are credit blacklists in Japan. So I'm thinking there may be more to this than you are aware of. I appreciate this, but I used to know many foreigners who said something similar prior to March 2011. The reality is that having a Japanese spouse and a card in your pocket which says you are allowed to stay permanently is no guarantee of anything. Neither does being Japanese - I know Japanese people who left after 3/11, and never returned. And I know foreigners, myself included, who left, paid our bills while gone, and came back afterwards. I'm also a PR with a family in Japan, but life happens to everyone. If one of my overseas family members were to suddenly become ill or die in an unexpected accident orphaning their children, I might have to leave Japan on short notice. Hopefully I would have enough money to settle any outstanding obligations, but many foreigners would not. Again, more racial biases based on stereotypes, rather than in empirical data. You have shown nothing to support your perceived biases, you just simply claim them as if they are fact. Same kinds of things supremacists claim about jews, blacks and [insert ethnic group here]. I'll grant you this. It might meet the strict definition of xenophobia, but it's not completely irrational or unjustified xenophobia. Without empirical data, it most definitely is irrational and unjustified. You are trying to say that racial biases are self defining. You are saying that because you believe them to be true, they are. The same concerns would apply to any Japanese citizen who tries to rent an apartment in Tokyo but has their locus of activity in Hawaii, most of their family in Hawaii, friends in Hawaii, employment prospects in Hawaii, etc. I disagree - my brother in law has been in China the past three years for work, and still pays his place here. He has not faced any discrimination on this behavior. There is an element of this, but Japan isn’t generally very good at dealing with foreigners. Many Japanese themselves will tell you this. It isn’t Japan-bashing to point out a bad point which many Japanese themselves acknowledge. All countries have their flaws. I'm not complaining that it doesn't exist, I'm pointing out that due to its lack of existence, you are discriminating based on race without any empirical data. The pure definition of racism/bigotry. It's like when Trump refused to rent to black people in the '70s. Bass will argue it's justified, because black people were [fill in bias here]. And let's assume that [bias] is even accurate for the group - if I as a person who has a stellar credit record am denied rental due to being a member of that group, then you are literally being racist against me. You are punishing me for the actions of someone over whom I have zero control nor association, for actions I have never purported, nor ever will. That is racism. this kind of attitude is not restricted to "homogeneous" nations like Japan. It's also fairly common in immigrant nations. The first group of newcomers arrives, adapts or assimilates to varying extents. Then a certain portion of them promptly turns around and cr--s all over the next wave of arrivals. Aka: Quick I'm in, shut the gate behind me! oldman, it seems to me that most of the energy on this thread revolves around foreigners criticizing the attitudes and beliefs of their fellow foreigners. On paper, this looks like a good initiative. How it'll play out in practice, who knows. Or simply that we've made it. Obviously, everyone on JT is "online-wealthy" and untroubled by the day to day issues the fresh off the boat rabble face. I just fail to distinguish between the Nepali girl serving me lunch, the IT professional and your average English instructor. Regardless of how long we've been here, our income or class, or where we've come from, I feel like we're all in this together. And the attitudes expressed by many above only reinforces the prejudices of (some of) our hosts, making progress that much harder, for us, for our kids etc. Strangerland, if you make that month, you shouldnt be using those station areas low income agents... go to resident first or any other high earner agencies and you will have suitable apartments with no questions asked. Yes Japan should struggle more to help foreigners, especially those with PR who like the society. To do that, why doesn't Japan to cease unwanted SPR whch discrimates those with PR. Let it be fair. Why not? I was raised to not live ostentatiously. But that doesn't change the underlying problem of refusing to rent to people based on their ethnicity, rather than their actual circumstance. Wow! It must be a slow day at the office. So many long winded posts. Many of which contain misnomas and untruths. The rental problems for foreigners are based around comminucation difficulties. The contracts are very complicated, even for Japanese people. Any further communications are also difficult. It is too much to expect Japanese agencies to include foreign language contracts and services despite most Japanese studying English for ten years or more (and learned nothing). It is easier for these agencies to alienate foreigners than to make exceptions for them. I fear most of the 200,000 foreign workers coming to Japan over the next few years in the exchange working program will have extreme difficulties securing housing, especially because the majority of them are going to rural areas. They will have to live in dorms or be billeted and exploited. The rental problems for foreigners are based around comminucation difficulties. No, they are based around perceived communication difficulties. I speak Japanese well enough to run a business, and do presentations in front of hundreds of people in Japanese. These landlords are not communicating with me and making their determination, they are deciding that because I was born on the wrong piece of soil, they will not rent to me. yea.. they should build those worker barracks in low income secluded areas... best and easiest solution, anyway they are limited in 3 years stay so its pointless to make waves in society and inconvenience residents. you are cheap, in general .. you expect to live by the lowest denominator while being a guest here, and yes you will be a guest here forever regardless of your visa or make a passport, become japanese and nobody will blink an eye. Neither cheap people not wasteful people do well at business. Believe it or not, there is such a thing called ‘balance’, where you decide which areas you feel are worth spending money on, and areas you feel it’s not better. As for not ever being Japanese, why would I want to be? My being foreign has provided me with lots of benefit. And I wasting time and energy on stressing about being something I’ll never be - Japanese - is a waste of time and energy. 2.Your nickname tells it all, , once you will feel you not a stranger, you will be surprised how easy things are., and how much actual benefit is looking different and speaking multiple languages while being accepted there is. You’ve misunderstood my name. It has nothing to do with my being a stranger. Before I moved to japan I commented on how strange japan is to my mentor. He told me “there’s always a stranger land”. Youre not so good with your suspicions it appears. 0/2. Tbf, racial discrimination has always been pretty common/widespread in the rental market, here and abroad, esp for 1-2 bedroom-flats. I knew quite a few landlords in sydney (including dinki di aussies, euro/oz and even chinese/oz) who discriminated against their own ppl and only rented to korean/japanese/hongkongese, ideally women (i.e. rental listings on sites like gumtree have plenty of 'would suit asian student' , 'japanese/korean female only' etc ads). Why? cause they're -supposedly- clean, quiet, docile, cashed up, don't smoke/drink/party/do drugs, pay on time etc. Ideal tenants, i guess, if you've got a 1 bedroom apartment. I don't particularly like it obviously but i sort of get that J landlords do prefer to rent to J tenants in J. It started off like "Does anyone know what human rights are?.... So no one knows then"
And then they cited the McLean precedent, and said foreigners don't really have human rights. Which aside from being quite misleading, I really wasn't sure why they came at that point, and I just sat through the rest. I don't think they knew what they were talking about. Hopefully the people in your jurisdiction are better trained. I notice the little footnote caveat, not enforceable unless agreed by both parties so that ensures it will achieve nothing. I do not want to sound negative or continue the negative tone here; however, while the consultations sound great, I will be very skeptical about this until I see some kind of results from this measure. In most cases, I can see this ending up being more of a way to condemn people within their organizations. If you file a complaint, they investigate it by contacting your employer to find out what happened and simply leave it at that, this could severely damage your working relationship with your employer. Seems like it can be far more harmful than good. This summarised it all. Nothing to add. I do not know the Japanese law on that matter. But it is quite common worldwide that operating a public business (restaurant, coffee shop, pool, hairdresser, ...) need a license stipulating that it cannot restrict to any customers (assuming they behave properly, which is another topic). Funny, heard the same thing being said from a guy who doesnt like renting to Japanese from mainland! @zones2surfMar. 1 08:56 am JST Wonder if they will also handle foreigners complaints regarding mistreatment by J cops! Police, NPA, bar associations, prosecutors office, MOJ and all the rest already have complaint 'soudan' windows, problem is they are all staffed by workers at those ministries and will do nothing, it's all window dressing. I've been to my local office to complain over one of my neighbours physical behaviour to my property, but as soon as they learnt he was Japanese, their response changed from sympathy to disinterest. Japan isn't alone in that attitude of lack of impartiality. As foreign residents we are expected to be quiet, hidden in the background, subservient. Goshn learnt the hard way... but he's not alone. You are already living in such a world. Businessess in Japan do have a right to discriminate against whoever they want. I have seen ''Only Japanese'' signs in front of shops, what do i do? I go find another shop. Who cares. If you think businesses in Japan are so racist, why isn't every business banning foreigners? And if they do that, you can open a shop only for foreigners and become right. Businesses discriminate on many levels. There are shops in Japan only for people dressed in a certain way. There are shops only for women. You can't walk into a luxury restaurant dressed like a hobo, they will kick you out, that too is called discrimination. Bigotry trumps rights, but money trumps bigotry. No matter how much i hate certain people, my evil greedy desire for money will force me to serve them. so if the next time you go to your local coffee shop or COOP or pub and they listen mate, we don't want whites, blacks, Chinese--insert your ethnicity--in here, we'd like you to leave, you'd be OK with that? Or say you have a kid, and they were treated in similar fashion, you'd still feel sanguine and shouganai about it? Of course i will not be OK with it, i would probably be pissed, BUT i will respect their right to serve whoever they want ON THEIR OWN PROPERTY. I will probably just cuss at them and leave and go find another pub. You can't seriously be thinking that ALL the pubs in the whole city will be racist, are you? If that is the case, i will just invest my own money into a pub specifically designed for foreigners like me, and i will get rich. The truth is that, businesses that discriminate against certain groups of people are extremely rare, and those businesses are more often than not short lived. If you encounter them, just respect their right to be racist and move on with your life. Because the landowner owns the property, and he has the right to choose who they want to serve, and who they don't want to serve. They don't even have to give you any explanation just like i don't have to give you any explanation for why i don't want you to enter my house, or the moderators of this website don't have to give explanations for why they choose to ban me or anyone else. You can see why randomly banning people without good reason would be bad for their business. Same goes for every other kind of business. There are rare exceptions, when you encounter them, just ignore them. I find it odd that these notices/posters/ads from the Ministry of Justice's human rights bureau don't have any Japanese faces. Who are the Ministry of Justice's human rights bureau targeting with these notices? Of the 32 faces displayed on these notices, 5 are brown, and 18 are pink. Where did these notices originate? Were they originally intended for distribution in Japan? People, lets give this initiative its opportunity to do good. I would imagine they will have in place forms to fill out and ledger it for official record use. My only concern is if they truly intend to follow up and resolve cases by taking the right course of action.